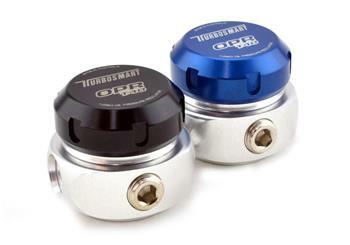 Turbosmart’s new patent pending OPR T40 is an oil pressure regulation system for your ball bearing turbocharger. It helps prevent compressor or turbine stage oil leaking or smoking, and takes the guesswork out of oil restrictor sizing for more efficient and effective oil delivery. Providing an aftermarket turbocharger with the ideal oil pressure has always been a challenge. Traditionally, the turbocharger’s oil feed has relied on a restrictor system, which are difficult to set up correctly. When incorrectly sized or set up, they can be the cause of turbo seal leakage and blow-by. Turbosmart’s Turbo Oil Regulator ensures the oil pressure going to the turbocharger never exceeds the maximum pressure turbocharger manufacturers specify for oil supply, regardless of engine oil pressure. The result is an oil delivery system that is more reliable and easier to setup than a standard restrictor system, especially when combined with Turbosmart’s new range of turbo fittings and filters. The OPR T40 can be used with a Turbosmart FPR gauge to monitor oil pressure levels. They are an ideal companion to Turbosmart’s new range of turbo fittings and oil feed filters, completing a new range of products that makes the safe and reliable operation of your turbo easier to achieve than ever.